A friend got me on to EVE Online a couple of years ago. Despite an apparently widespread opinion that it’s a spreadsheet simulator, I quite enjoy it for its Star Trek-on-nerd-steroids vibe. Outer space in RL is awesomely beautiful, and EVE has enough simulated space prettiness to satisfy APOD cravings while you go about your particular flavour of business. And whatever your business you need that eye candy to get you through it, because EVE is one of the most prolific learning curve generators I’ve ever encountered. There’s a steep learning curve to every action or profession you undertake in EVE; the game can be simultaneously tedious and engrossing, but the time in/knowledge out ratio is unparallelled. 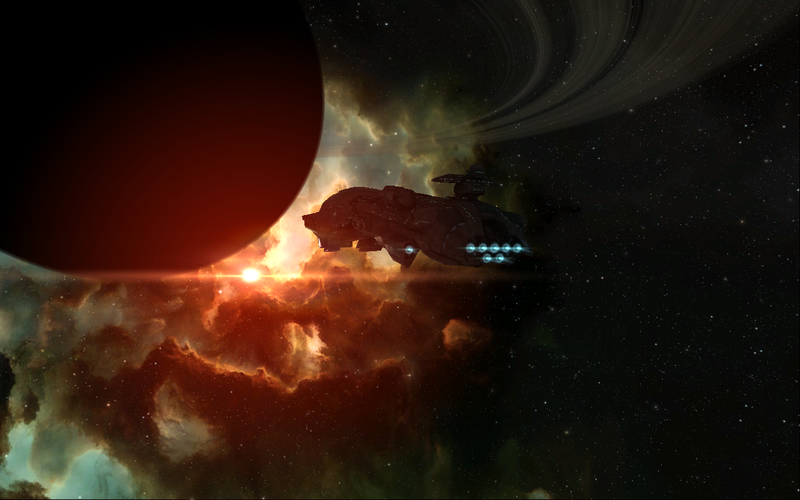 Every six months or so, EVE is updated by an expansion. These usually include some kind of story-backed changes to the game world (read: different ways to kill other spaceships) along with various alterations to the mechanics of gameplay. One of these expansions came out in November 2012, just a couple of months ago. I didn’t get a chance to play EVE until after Christmas, but when I did I noticed quite a lot of things had changed, and I was pleasantly surprised that the dull and discordant theme music from the previous expansion had been replaced by a new theme with spirit. There’s a new main theme tune with every expansion, and sometimes they’re not so amazing. EVE (like most MMOs I’m sure) serves you up enough hours of play to make the in-game music far more familiar to you than any of its title themes. Usually it’s the title theme which sets your emotional compass when you launch a game, and the title theme of a new game in an RPG series can put you right back in the world even before you’ve started playing. But in EVE the function of the title themes is almost cursory compared with the homeliness of the synth pad-driven background tunes. The vast majority of the visual elements in the game today have undergone some kind of change since I started playing two years ago, but the music has not. It welcomes you back into the universe while you’re adjusting to other things, subtly going about the business of holding the whole game together. Strangely, there’s far less music fatigue than I’d expect. The tunes are full of melodies and harmonic variations, so the game’s creators seem not to have attempted to avoid fatigue too hard. Perhaps familiarity breeds contempt only to a certain point, beyond which familiarity is a comfortable state of equilibrium. I could never say the music doesn’t get boring, and it’s hardly mistakable for Koji Jondo or Jeremy Soule, but it accompanies you through tough learning curves and space battles and somehow earns its place. Though the universe of EVE can be a dangerous place to fly, it always sounds a little bit like home.